Deals never come this sweet as the best low cost carrier Air Asia and Air Asia X gives you what you've all been waiting for! It's back! Piso Fare seats will start seilling today November 25 up until December 1, 2013. Guests would be able to travel from May 5, 2014 to January 31, 2015 on local and international deatinations because it's not too early to fly! Imagine only paying 353.92 including duties and taxes for a single journey for domestic destinations. They also have BIG discounts on international ones if that's what you want. If that isn't a good deal, I don't know what else is. 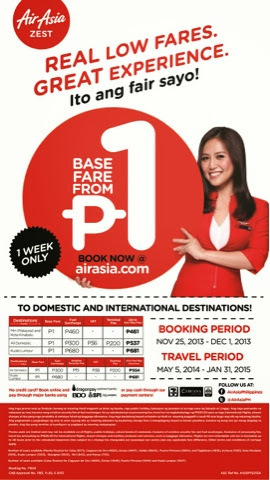 Head on to their official website http://www.airasia.com or follow them on twitter @AirAsiaPH for more details.